Aloha everyone! Happy Friday :) I'm excited to have a big weekend ahead. My niece is graduating from high school Saturday and we'll have lots of family in town visiting. And let's not forget Father's Day...this year I'll actually get to enjoy time with my own dad and my hubbie on the same day! I don't think I've ever spent a Father's Day with the two of them together before. So, my question for today is: How do you plan to celebrate Father's Day? Whatever you do, I hope you have a wonderful weekend! Thanks for stopping by. Check out this post for some Dad's Day ideas. 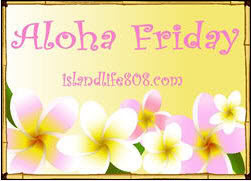 And don't forget to visit An Island Life for more Aloha Friday fun. We hope to go strawberry picking and possibly use our season passes to Six Flags this weekend. We also have free tickets to bring people on Sunday and trying to figure out if my parents will go with us. It's a normal day for me over here! No plans! We are having a big cookout/pool party tomorrow with family celebrating my birthday and Father's Day. Should be a fun day for all to enjoy! I don't have any plans right now. I haven't talked to my dad for a month because he's been out of town! Have a great weekend! No plans....lol. He'll probably be watching golf. We may go see Toy Story 3 and will work on building our garden. Do I Smell Peanut Butter and Chocolate?